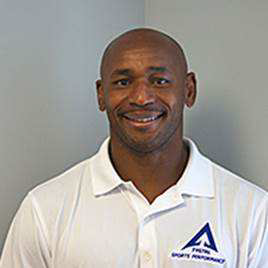 Coach McCants is a former track and field high jump champion from the United States that ran track and field at the University of Alabama Crimson Tide from 1983 through 1985 and professionally from 1985 through 1996. Thomas is seasoned at finding ways to overcome diversity. Thomas, the ninth of 11 children, lost his mother when he was 10 years old. After spending his early years in Daytona Beach Florida, Thomas went to live with an older sister in Auburn, NY. In a difficult situation, Thomas had little guidance or encouragement to figure out how to make use of the talents he had been given. Thomas began participating in organized sports as well as began focusing on his education. Ultimately, Thomas was given a scholarship to Mohawk Valley Community College in Utica, New York where he played basketball and was also asked to come out for the track team. He jumped 7 feet 1 inches in his first year. Thomas was given a scholarship to attend the University of Alabama as a member of the Track and Field team. Thomas never looked back! While on the professional track and field circuit, Thomas was invited to train with the German National coach for 3 years. During this time, Thomas learned many of the core and foundation training techniques that led to his breaking of the American high jump record. Through the years, Thomas has been able to further refine and develop these training techniques. Throughout his athletic career, Thomas has had the goodfortune and pleasure of competing across the globe. Thomas amassed a number of accolades as a student and member of the Alabama Crimson Tide track-and-field team, as well as the US Track and Field Team. After a distinguished career with the Boys and Girls Club, Thomas has turned his focus to training championship athletes. He has found yet one more avenue to help instill the desire to achieve excellence and how to triumph over adversity. Thomas lives with his wife and son in Alpharetta, GA.